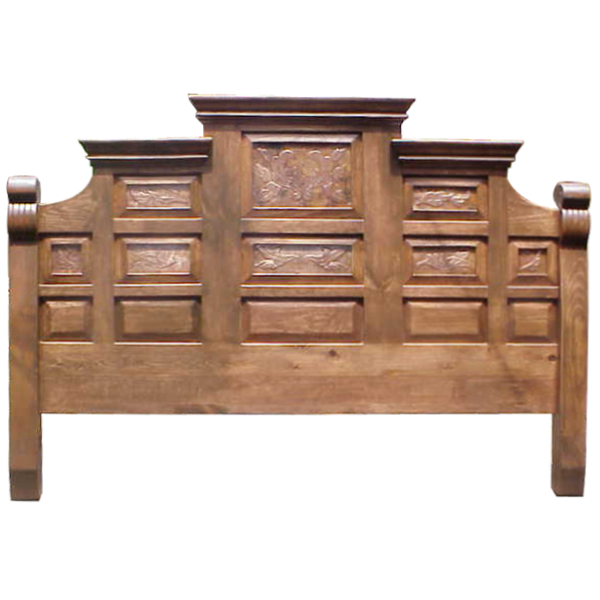 We have a variety of beautiful finishes available, and this marvelous, handcrafted, Spanish colonial headboard can be stained in a finish appropriate for your home décor. The headboard has a staggered, top, crown molding, and the front of the headboard is adorned with thirteen, geometric, cut panels. The top eight panels are covered with hand hammered copper, and the copper is embellished with exquisite, hand tooled, copper, floral details. The headboard is framed with side uprights, and the top of each upright is accented with fluted and scroll details. The uprights flow downward to form its tapered, square cut legs. The headboard has a natural finish, and it is made with the best, sustainable, solid wood available. It is 100% customizable.